Country superstars Brad Paisley and Carrie Underwood will be returning to host Country Music’s Biggest Night in 2016. 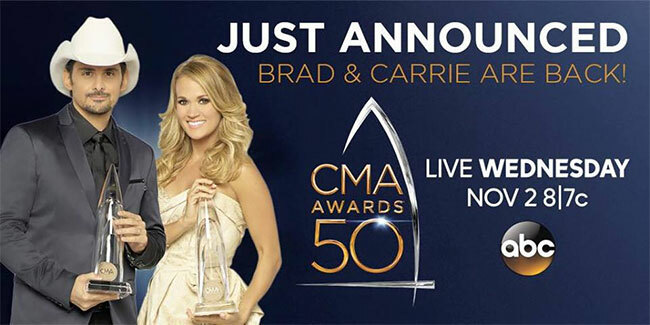 “The 50th Annual CMA Awards” airs live from the Bridgestone Arena in Nashville Wednesday, November 2nd from 8-11 PM/ET on the ABC Television Network. The return of the popular pair was announced during Paisley’s appearance on Jimmy Kimmel Live! and via Underwood’s social network. The follow-up CMA social announcement included a video highlight reel of the first 50 years of CMA Awards moments. The first “CMA Awards Banquet and Show” was held in 1967. The following year, the CMA Awards was broadcast on television for the first time – making it the longest running, annual music awards program on network TV. The CMA Awards have aired on ABC since 2006. ABC will be the network home of the CMA Awards and CMA’s other two television properties, CMA Music Festival: Country’s Night to Rock and CMA Country Christmas, through 2021. Ticket information for the CMA Awards will be announced later this summer with information available at CMAawards50.com.